The Thomas H. Ince photographs span the years 1912-1925 and encompass 10.2 linear feet. The collection consists of approximately 9,000 black-and-white prints. The photographs are grouped into motion picture production photographs and biography photographs.The motion picture production photographs span the years 1912-1925 and consist of scene photographs from 579 films. The material is arranged alphabetically by title. Titles include "Anna Christie" (1923), "The Bargain" (1914), "Custer's Last Fight" (1912), "The Gun Fighter" (1917), "Human Wreckage" (1923), "The Informer" (1914), "The Silent Man" (1917), "The Square Deal Man" (1917), "Wolf Lowry" (1917), and "Wolves of the Rail" (1918).The biography photographs span the years 1912-1925. The material is arranged alphabetically by name. Persons depicted include Madge Bellamy, Charles Chaplin, Jackie Coogan, Buster Keaton, Louis B. Mayer, Marshall Neilan, Mack Sennett, Blanche Sweet, King Vidor, Woodrow Wilson, and the Ince family. Also included are photos of Ince’s residence (Dias Dorados) in Beverly Hills, CA, and of the Ince Studio in Culver City, CA. Thomas H. Ince (1882-1924) was born in Newport, Rhode Island. The son of stage actors, he appeared with several stock companies as a child. He was later an office boy for theatrical manager Daniel Frohman. 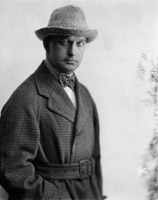 By 1910, he got a short-lived job at the Biograph Company and soon became a director for Carl Laemmle’s IMP (Independent Motion Pictures) Company. There in 1911 he directed a series of Mary Pickford films in Cuba to avoid harassment by the Motion Picture Patents Company. Later that year, Ince joined Kessel and Bauman’s New York Motion Picture Company (NYMP), producing and directing films from the company's Los Angeles studio. Ince’s reputation for producing quality films was so renowned that the studio became known as Inceville. In 1914 Ince invited his friend William S. Hart to star in a series of Westerns that proved to be very successful. In 1915, after a corporate shuffle, Ince and fellow principals Mack Sennett and D.W. Griffith formed the Triangle Film Corporation. Here he produced his best-known film, "Civilization" (1916). In 1918 Ince left Triangle and built his own studio in Culver City, distributing his films through Paramount-Artcraft and Metro. With Allan Dwan, Mack Sennett, Marshall Neilan, Maurice Tourneur, and other lesser-known filmmakers, Ince formed Associated Producers in 1919, which merged with First National in 1922. A pioneer filmmaker, Ince is regarded by film historians as the inventor of the role of “film producer,” as he was among the first to organize production methods into a disciplined system of filmmaking. His other notable pictures include "Custer's Last Fight" (1912), "The Coward" (1915), "Human Wreckage" (1923), and "Anna Christie" (1923).